More autocrossing, this time a trophy! 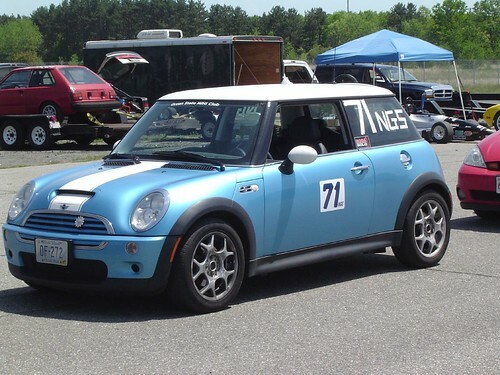 I'm still WAY behind in my blogging, to the point that I've done a few more autocross events. In fact, my car has gotten "chopped" since this event, and I've had to move into a higher modification class. But, I wanted to tell you about this one anyway. 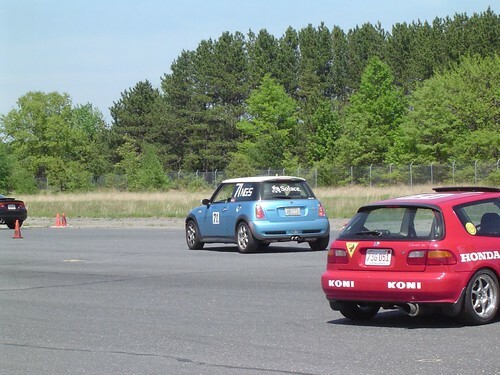 This was my second autocross event, held at Devens, MA last May (yes, I am WAY behind, I know!). The course was long, at least from the first event I went to. While my first event was in a large parking lot, this event was held at an old airfield runway, allowing the cars to get up to much higher speeds. 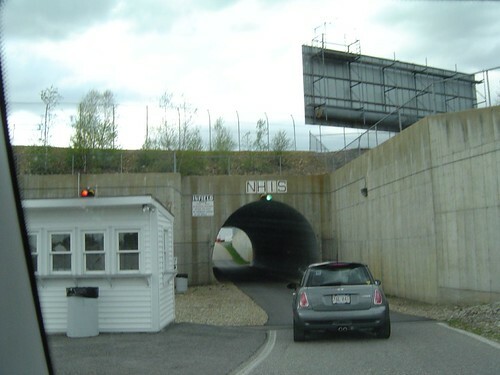 Devens used to be Fort Devens, and used to be a huge army barracks. It was later used only as a training facility, and now doesn't do much of anything, as far as I know. Which is good for the SCCA, as now there are these huge runways just sitting here, waiting for cars! Here's Eloise, waiting to get into the grid (the main parking lineup to get ready for your heat). Right now she's in what's called "the paddock", in which cars line up, empty out all the contents, and get tech checked. Yes, it takes awhile to empty out a car! Floor mats, loose change, wheel caps, they all have to be off the car. What's normally a basic luxury can become a projectile missile while cornering and braking at high speeds. When the car gets tech checked, the inspectors are looking to make sure the car battery is held down tightly, and everything looks in place. The "NGS" in this stands for Novice, G-stock class. It's in stock category at the moment, as I haven't done any tuning modifications. I actually came in third in Novice stock class, which let me take home a trophy that day! Considering it was only my second event, this was very exciting. I'll post pictures of my most recent autocross soon, now that I'm not in stock class anymore, I think my brief day of trophying is over, but we'll see. 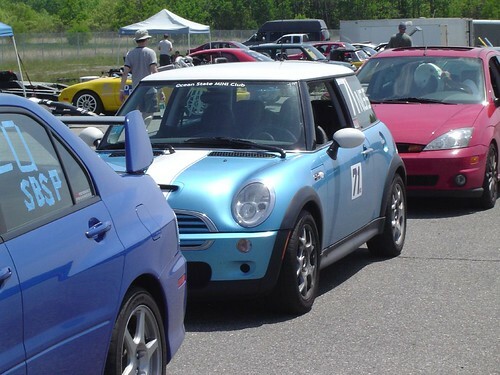 An autocross is a skill driving event in which one car at a time negotiates a prescribed course, using traffic cones to define a variety of turns. The sites are usually laid out on huge, open parking lots, or on sections of airport runways. The course is set up so that you are operating in lower gears, with a top speed of no more than 60 mph or so, depending on the car. The average time of a run on the course is approximately one minute, plus a penalty of two seconds for each rubber cone (pylon) hit. During each run you operate your car at it's limit of acceleration, turning, and braking...and yours. You maintain complete control of your car while maneuvering through the course in the lowest possible time. While driving on the street, the time span of most emergencies is only a few seconds. Thus the experience of maintaining control becomes a valuable training session. 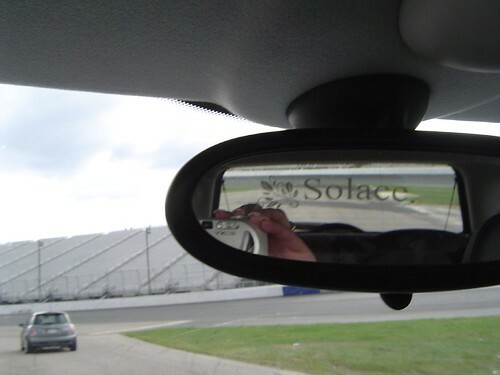 You will develop a sense of timing, judgment, and ability to interpret your vehicle's handling characteristics - at safe speeds and in a safe place. Your experiences at an autocross will enhance your driving ability on the street. It's really fun, and really easy to get started. Cars are placed according to class, not driver, so you always have a competetive chance to take home a trophy. Anyone can do it with their street commuter car, or a suped-up hotrod. Great driving lessons in control, AND you get to really open up your car and see what it can do. You can see why a MINI would be great fun. My problem when I started was that I never went fast enough... the instructors kept telling me "go faster, dammit! If the pedal is not on the floor through those slaloms, you're not going fast enough!" Finally one time I took him up on it, sure enough - pedal to the medal while simultaneously moving the wheel side to side through the slalom cones. Sure enough, not only did I NOT lose control, but the car drove better because I WAS in control, and I knocked four seconds off my time. I saw a great quote in the signature file of another driver: Drag racing measures fast cars. Solo2 measures fast drivers. Here's me and my friend Maureen in a MINI in front of me. This wasn't an all-MINI event - we just clicked! Find your local SCCA branch. It's the single easiest way for anyone to get started having a little fun with their cars - no performance parts needed. If you have them, great, but you'll get put into a different class than an all-stock car. "Two to the power of one-hundred million and falling." I have much to write about, so hopefully one of these days I'll play catch up. I'm working too hard during the week, but playing just as hard on weekends. In between building my new company, getting set up to accept credit cards, and generally learning as much as I can about owning and operating a business, I have also been doing weekend racing (autocross), and taking trips up Mt. Washington in NH. 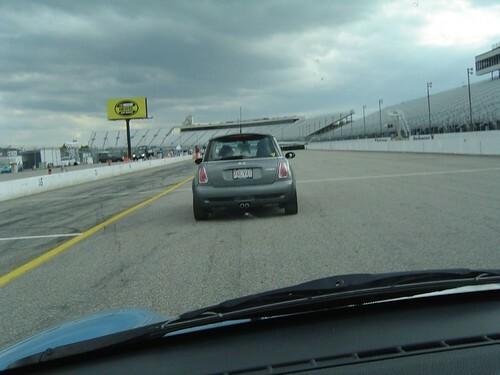 The racing has even involved getting to do touring laps at New Hampshire International Speedway! We've also been building a firepit in our backyard, and household projects have been calling. If I'm lucky, I may even manage to post all my blog pictures in chronological order. If I can still remember that far back! I got a tattoo, so Eloise wanted one too! Marion McLaughlin, my partner in crime on Notes.net is blogging! Finding Solace in Westerly, RI. Acrylic nails - do they come with instructions?